Witness a city that's in love with festivals, the arts, good food, living well and enjoying life to the hilt. The backbone of Montréal’s Francophone shopping district, Rue St-Denis is lined with hat and garment shops, uber-hip record stores and terrace cafes designed to keep people from getting any work done. Summer crowds flock to the inviting bistros and bars on both sides of the street. 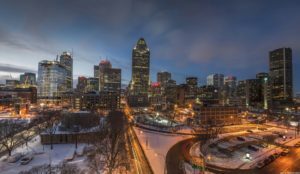 Montreal’s Old Port has morphed into a park and fun zone paralleling the mighty St Lawrence River for 2.5km and punctuated by four grand quais. Locals and visitors alike come here for strolling, cycling and in-line skating. Cruise boats, ferries, jet boats and speedboats all depart for tours from various docks. In winter, you can cut a fine figure on an outdoor ice-skating rink. Montréal’s famous landmark, Notre-Dame Basilica, is a visually pleasing if slightly gaudy symphony of carved wood, paintings, gilded sculptures and stained-glass windows. Built in 1829 on the site of an older and smaller church.